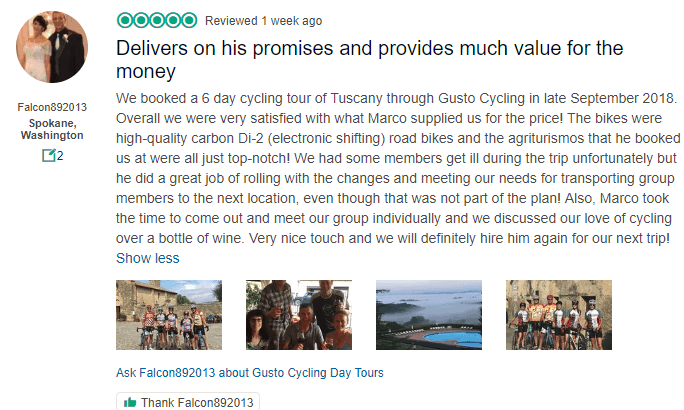 At Gustocycling we take pride in offering a first class service no matter which type of package or trip you have booked. We take great care to ensure all our customers are very happy and want to book with us again. Please have a read below to see what our satisfied customer had to say about us or visit our 5 start Tripadvisor page. 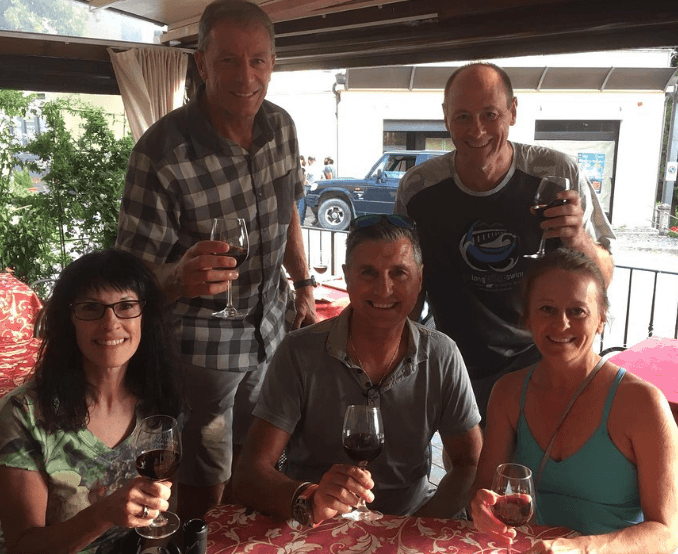 When we started to look at visiting Tuscany our group wanted a trip that we could get out of the cities and feel the culture. 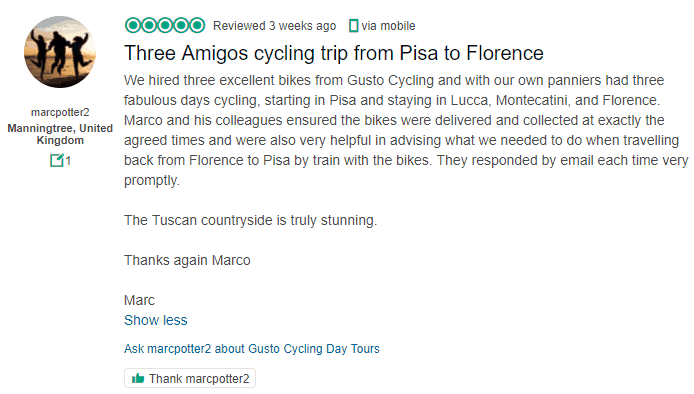 Marco took the time to listen and we were amazed at the results…. The first day was to get our bikes and as most cyclists are aware you like your bike at home and don’t think that you will get the quality or care will be given on your rental bike!! I was very pleased to get the care and response from professional cyclists and the bikes were bar none better than what i had at home. Every thing was taken care of on the bikes as we needed and no complaints. A professional job!! The places we stayed brought the culture of Italy right to our hearts and minds. I can not say enough about the accommodations. In my opinion they we perfect!! Our ride was for 7 days and we were given a GPS maps for our phones and bike computers. As you know coming from a different country it can be a bit nervous to use alternate means of traveling. The GPS maps were perfect and we did not have one single issue riding around!! A lot of businesses get wrapped up in all the paper work and need to manage it was a pleasant surprise when Marco showed up to chat with us and took great care in listening to us on how the trip was going. 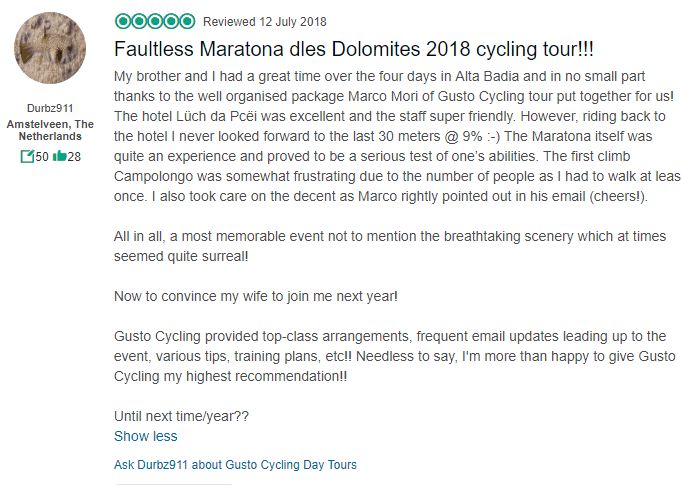 I walked away from this trip as one of the top adventures i have done and it was all in the prep work from Gusto cycling. Beyond a doubt I would use Gusto Cycling for all my travels to Italy. They were very responsive and accommodating. The adventure maybe over, but the memories will last a lifetime! 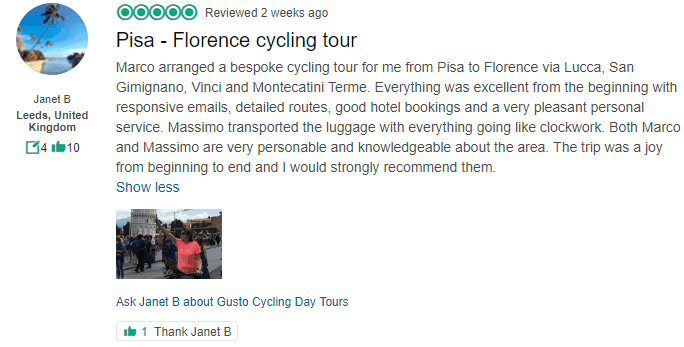 After deciding to travel to Tuscany Italy this summer, I did a google search and found Gusto Cycling. 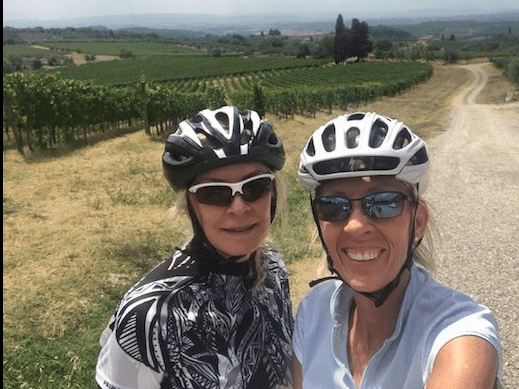 My friend and I couldn’t be happier with the choice and It couldn’t have been easier working with Marco to put together a personalized itinerary for 4 days of cycling through the Chianti Region. 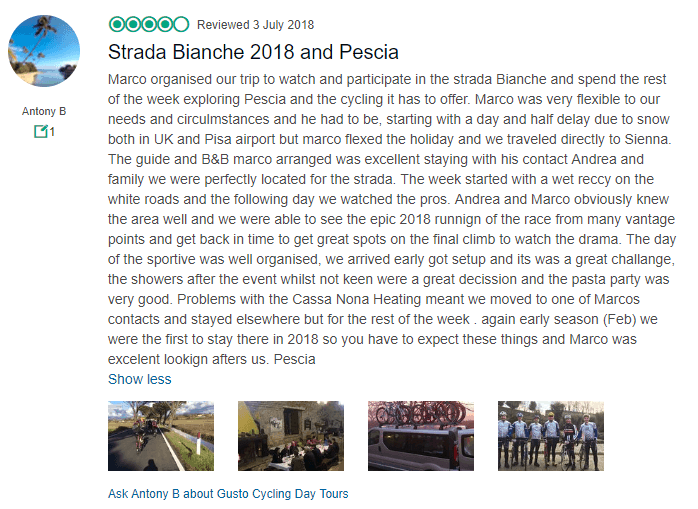 Marco put together wonderful cycling routes (based upon my specifications – medieval villages, breathtaking vistas, wineries, and countryside) and a fabulous choice of hotels for us. He met us before our trip, was there for us throughout our trip and always checked in to see how we were doing, and met with us after to hear all about our adventure. And what a wonderful adventure it was! The memories will last a lifetime. Thank you Marco Mori, you are the best!